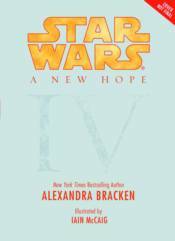 Acclaimed author Alexandra Bracken delivers a captivating retelling of Star Wars Episode IV: A New Hope like you've never experienced before, infusing the iconic, classic tale of good versus evil with a unique perspective and narrative style that will speak directly to today's young readers while enhancing the Star Wars experience for core fans of the saga. This illustrated novel is the first in the highly-anticipated series and features richly detailed art by celebrated Star Wars concept artist Iain McCaig. Fans old and new will be delighted by this beautifully crafted book and the unexpected twists in this retelling of a beloved story.